Nokia E6 & X7 New Family Symbian of phones ~ " World Information "
JAKARTA - Nokia want to repeat the success obtained by the E71 and E72, through the presence of Nokia E6. This brand-new Smartphone designed by Nokia is a tool for business and entertainment enthusiasts. Besides Nokia E6, Finland-based company also introduced the X7. 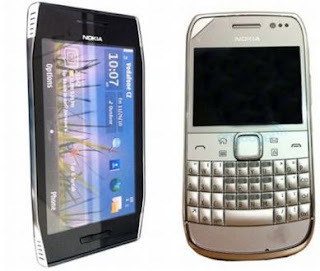 Both phones come with using the latest Symbian operating system, with the iconic brand-new and improved functionality such as text input easier, faster browser and Ovi Maps are more fresh. "We enrich the portfolio of Nokia smartphones with the presence of two new devices, both offer a more intuitive user experience and interest, which will soon be available on Nokia N8, Nokia E7, Nokia and Nokia C6 C7-01," said Jo Harlow, head of Nokia Smart Devices Business, as reported through its official statement on Wednesday (04/13/2011). "With the presence of these two new devices and other Symbian devices, as well as increased usability in the near future, we believe we can continue to maintain the fabric that has been created by the users of Nokia smartphones, as well as attract new users and users of smartphone competitors," he added. Nokia E6 bring the beauty of the design business smartphone equipped with a full QWERTY keyboard and touch screen high resolution. Designed using premium materials such as glass and stainless steel, this device comes in the right size for easy use with either one or two hands. Nokia E6 deliver exceptional battery life and messaging experience out-of-the-box best out of Microsoft in the smartphone business, including access to Microsoft Exchange, Microsoft Communicator Mobile and Microsoft SharePoint. Meanwhile, Nokia X7 is an entertainment smartphone with a screen width 4 "is ideal for playing games and 8MP camera to take pictures and HD quality video. Nokia X7 is designed in particular, made of stainless steel and glass combined with the smooth though without the connection, provide a sense of solid and strong when in the clutch. Nokia X7 is loaded with many popular games such as Galaxy on Fire HD and Asphalt 5 HD. The updated software also presents a series of new powerful features aimed specifically for business people, including the standard enterprise security with hardware encryption acceleration and a new email features like the ability to file a full meeting request. In the coming months of this software update, known as Symbian Anna, will be available as standard software for the Nokia N8, Nokia E7, Nokia and Nokia C6 C7-01 is currently produced, are also available for download through the serial device that has been present previously .